ACC (The Accident Compensation Corporation) provides 24-hour, seven-day-a-week injury cover for everyone in New Zealand, no matter where the injury happens – at work, at home, on the road or during sport or recreation. This assistance is aimed at helping you or your employees return to work or independence as quickly as possible after an injury. Are you aware of the income protection and rehabilitation options provided by your ACC cover? If you or your staff are injured in an accident and this impacts your or their ability to work, up to 80% of your income is protected by ACC. ACC has a specific package designed for the self-employed and shareholder-employees. Have you chosen to have the maximum amount of income protected through ACC? Are you aware there are options to restructure your protection with a balance of ACC and private income protection which could offer you greater value for money and more comprehensive protection? If you were to suffer an accident and consequently be unable to work, you may be able to receive payments from ACC to cover your loss of earnings at a rate of 80% of your income. If you were to make a claim on your insurance policy, anything you receive from ACC will be off-set against the insurance payment, reducing the amount your insurance company will pay. Exceptions to this are insurance policy wordings that may specify “no ACC offsets”. ACC CoverPlus, can help pay your medical and rehabilitation costs. It can also pay you weekly compensation for lost income if your injury forces you to stop working. Weekly compensation is based on your previous year’s income, so if your income varies from year to year (or your on-paper earnings don’t reflect your actual income) you can take out ACC CoverPlus extra. This is an optional cover at the self employed which lets you negotiate a fixed level of lost-earnings compensation. It also has the benefit of providing more flexibility around your occupation code and the associated levy for both you and the other owners of the business. This can be very beneficial when one owner is involved in manual tasks and the other is administration based. You will also receive your full amount of cover if you return to work part time on a Coverplus extra claim, rather then a reduced claim under regular cover. You have the option to reduce your ACC Coverplus extra income cover to the minimum of $28,880pa. This will reduce your levies. Those savings can be used to subsidise private income protection and/or key person protection providing more comprehensive protection for accident and illness. As an employer, you are required to provide work-related personal injury cover for yourself and your employees, whether they’re full-time, part-time or casual workers. ACC WorkPlace Cover provides businesses with the peace of mind of ‘no fault’ personal injury cover in the workplace. ACC WorkPlace Cover is the standard cover provided to all employees of a business. 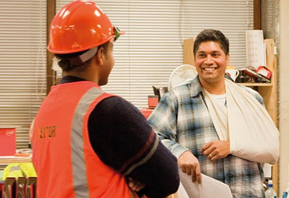 If an employee cannot work due to an injury, ACC may pay compensation of up to 80% of earnings. ACC will provide access to any other entitlements that apply, and can help provide rehabilitation to get your employee back to work as quickly as possible. Health and safety discounts are available which can provide a 10% saving. Injuries that develop gradually and are not due to a work task (non-occupational gradual process injuries). For more information about ACC in particular, visit www.acc.co.nz.